The New York State. Legislature. Joint Legislative Committee to Investigate Seditious Activities / Staten New Yorks lovgiveres fælles lovgivningsmæssige udvalg til at undersøge oprørske aktiviteter. Efter første verdenskrig publicerede udvalget, der blev oprettet i 1919 i forbindelse med den politisk begrundede kommunist-forskrækkelse i USA i årene efter kommunisternes revolution i Rusland: 'Revolutionary radicalism: its history, purpose and tactics with an exposition and discussion of the steps being taken and required to curb it', being the report of the Joint legislative committee investigating seditious activities, filed April 24, 1920, in the Senate of the state of New York / Revolutionær radikalisme: dens historie, formål og taktik med en fremstilling og diskussion af de skridt, der træffes og kræves for at begrænse den, er rapporten fra det fælles lovgivende udvalg til undersøgelse af oprørske aktiviteter, arkiveret 24. april 1920 i staten New Yorks senat. Rapporten som udarbejdes i tæt samarbejde med diverse efterretningstjenester, militæret og politimyndigheder så som Bureau of Investigation, udkom i fire bind på mere end 4400 sider. Bind to, tre og fire handler om arbejdsmarkedsforhold, fagfor-eninger og immigrationspolitik og -lovgivning rundt om i hele USA. Blandt de pacifistiske organisationer som omtales sidst i første del af rapporten kan nævnes: American Civil Liberties Union (fordi organisationen i lighed med en række andre, her nævnte grupper rådgav og støttede militærnægtere under og efter verdenskrigen), American Defense League, American Freedom Foundation, American League to Limit Armaments, American Liberty Union, American Neutral Conference Committee, American Peace Society, American School Peace League, American Union against Militarism, Association for International Conciliation, Buffalo Peace Society, Church Peace Union, Civil Liberties Bureau, Collegiate Anti-Militarism League, Conference of Neutral Internationalists and Pacifists, Congress of Forum, Emergency Peace Federation of 1915, Emergency Peace Federation op 1917, Federal Council of Churches, First American Conference for Democracy and Terms of Peace, Ford Peace Party, Forsoningsforbundet, Free Speech League of America, Den internationale Kvindekomité for varig Fred, Den internationale kvindekongres i Haag, Den Interparlamentariske Union, Kansas City Federation for Democratic Control, Labor Defense League, League for Democratic Control of Boston, League for World Peace, Legal First Aid Bureau, Liberty Defense League, National Civil Liberties Bureau, National League for the Release of Political Prisoners, National Peace Federation, No Conscription League, Non-Partisan League of North Dakota, Open Forum Speakers' Bureau of Boston, People's Council of America, People's Freedom Union, Political Equality League of Chicago, Single-Tax Club of Chicago, Woman's Peace Party, herunder lokalafdelingerne i Chicago, Minneapolis, og New York City, Woman's Trade Union League of Chicago, Workers' Defense Union, Workmen's Council for the Maintenance of Labor's Rights, World Peace Association, World Peace Foundation of Boston og Young Men's Anti-Militarism League. Se også: Hollywood blacklist ; House Un-American Activities Committee, 1938–1975; House Special Committee on Un-American Activities, 1934–1937 ; Special committee to investigate communist activities in the United States of the House of representatives, 1930 - Fish Committee ; House Special investigation committee, 1938–1944 ; Overman Committee, 1918-1919 ; Palmer Raids ; Permanent Subcommittee on Investigations of the Government Operations Committee of the U.S. Senate ; the U.S. Senate Special Committee to Investigate the National Defense Program, 1941-1948, eller "Truman Committee", the Investigations Subcommittee of the Committee on Expenditures in Executive Departments continued that committee's ; Subcommittee on Korean War Atrocities. 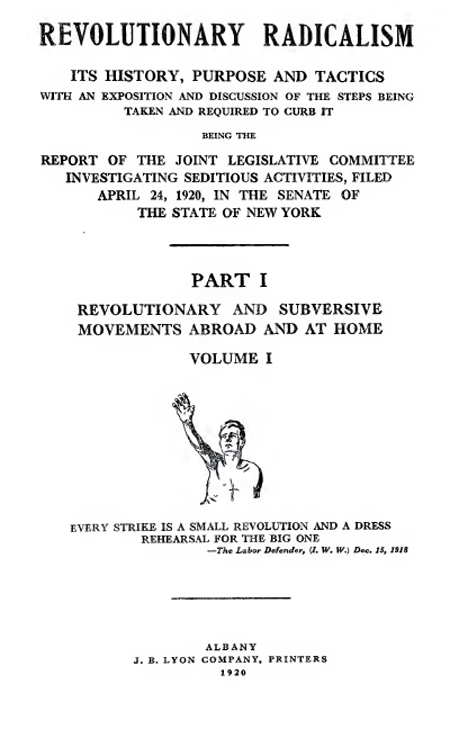 The Lusk Committee: A Guide to the Records of the Joint Legislative Committee to Investigate Seditious Activities: A Guide to the Records Held in the New York State Archives.